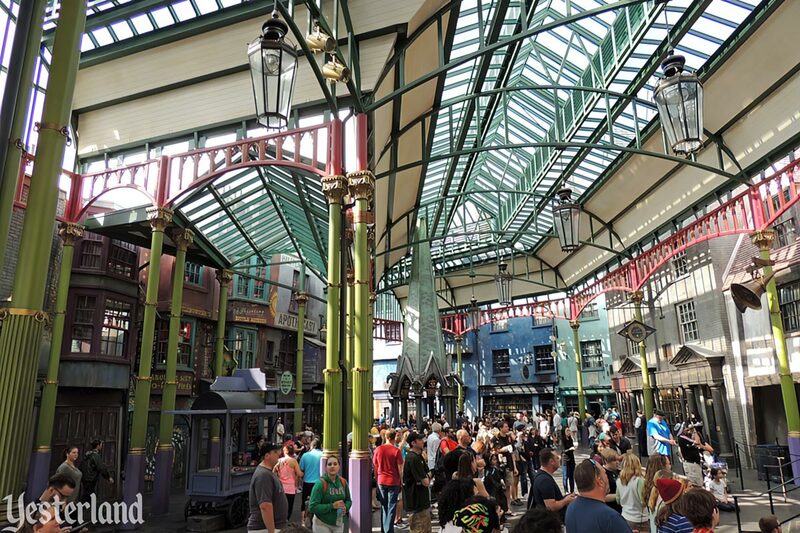 Diagon Alley at Universal Studios Florida is designed brilliantly. 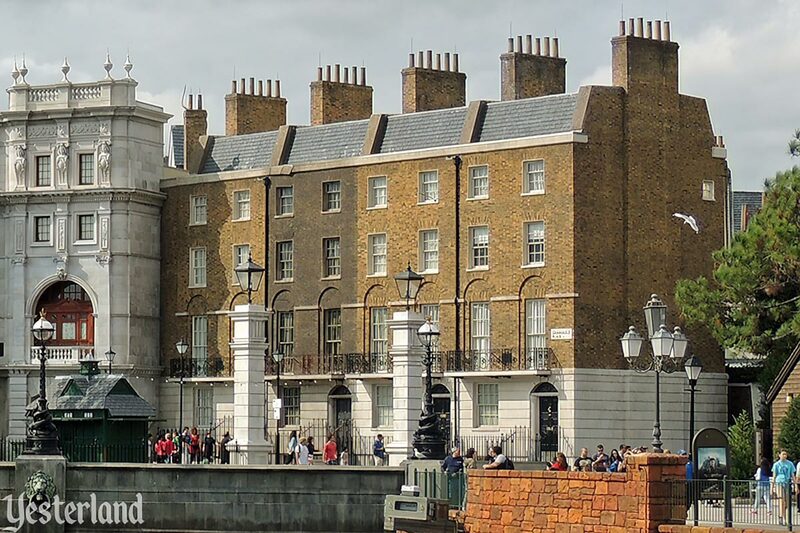 I recently visited some of the places in London that served as the models for Diagon Alley. 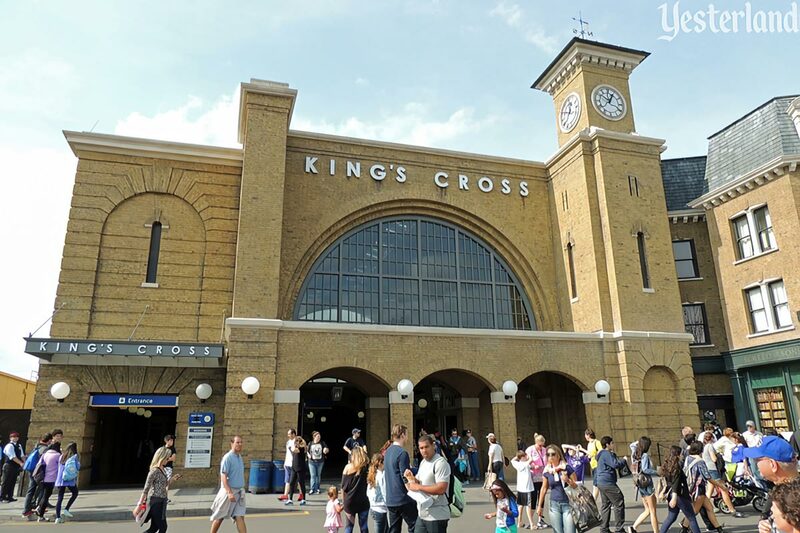 Universal has a “shrink and edit” version of King’s Cross Station—where Harry Potter caught the Hogwarts Express from London to Hogsmeade. 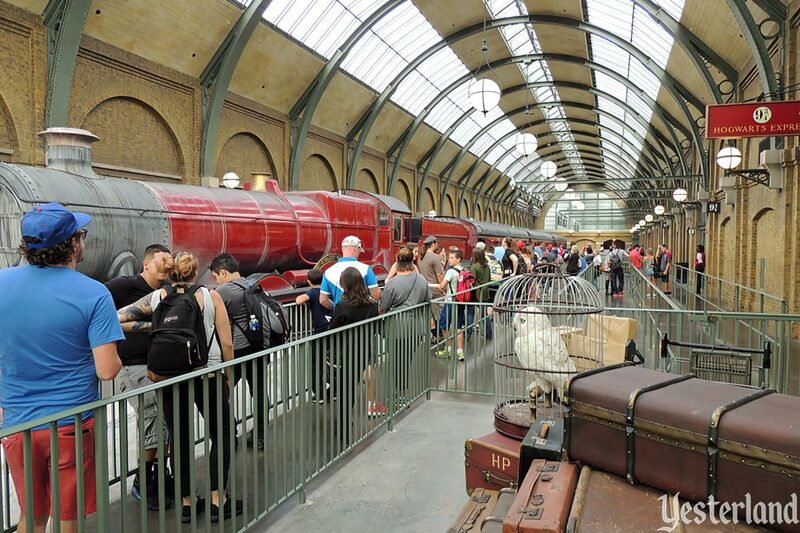 It’s where park guests catch the Hogwarts Express ride to Hogsmeade at Universal’s Islands of Adventure. 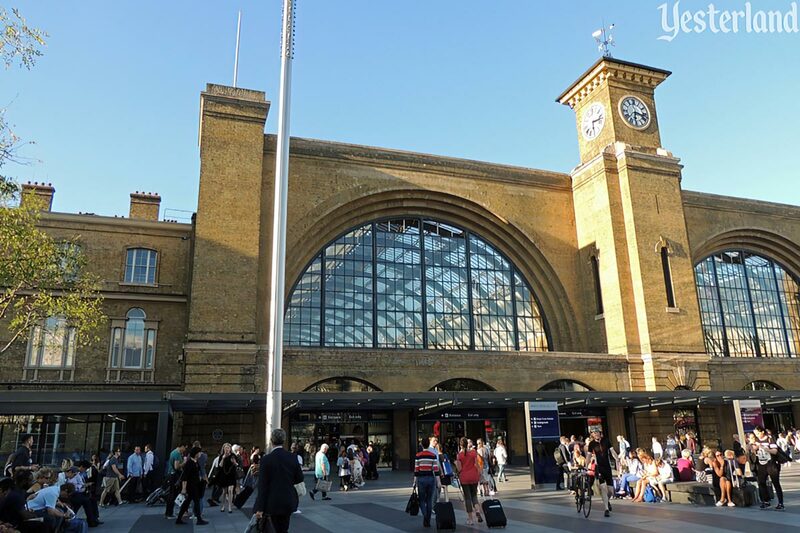 King’s Cross Station in London has two large train sheds, each corresponding to a huge arch on the façade. 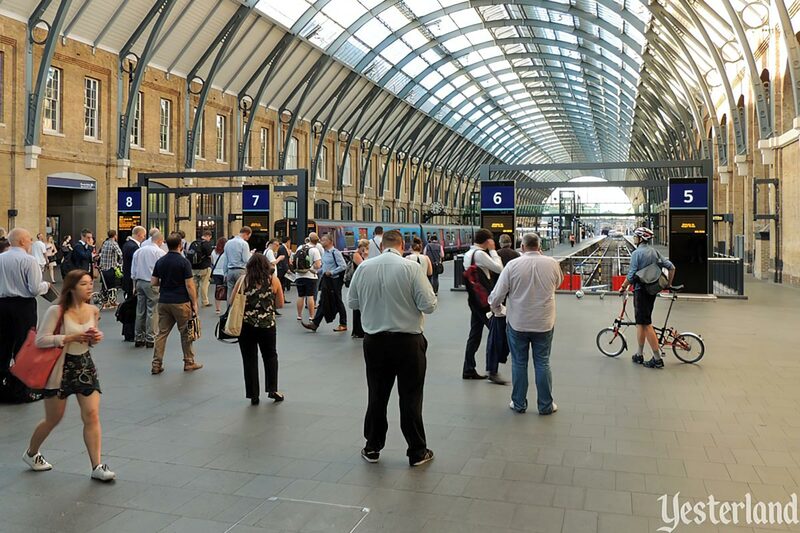 Universal has a single train platform—Platform 9¾, but it captures the feel of the London station very well. 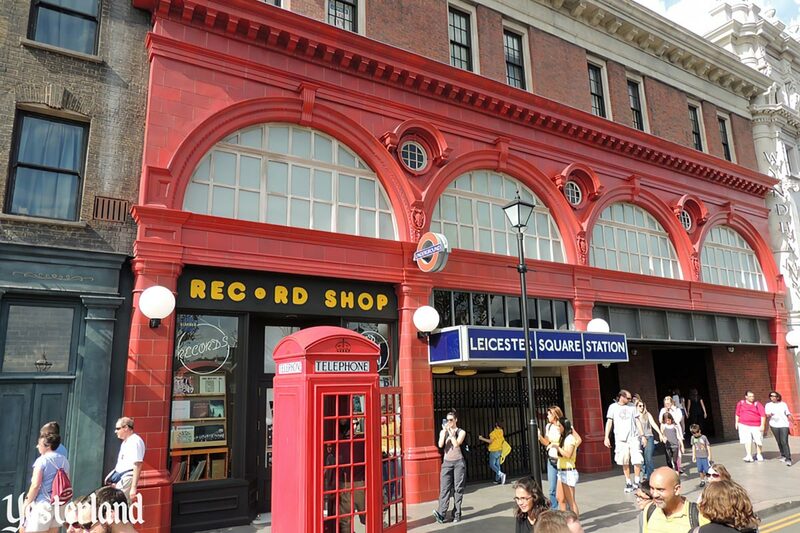 The real station in London now has a Platform 9¾ photo opportunity adjacent to a Harry Potter store. It’s become one of London’s tourist attractions. 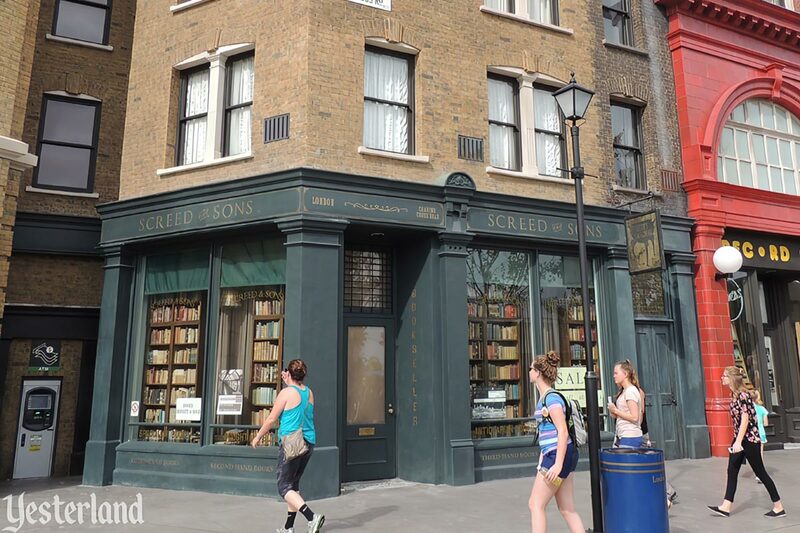 At Universal, there’s a book shop immediately to the right of King’s Cross Station. It’s just for atmosphere. You can’t actually go inside. 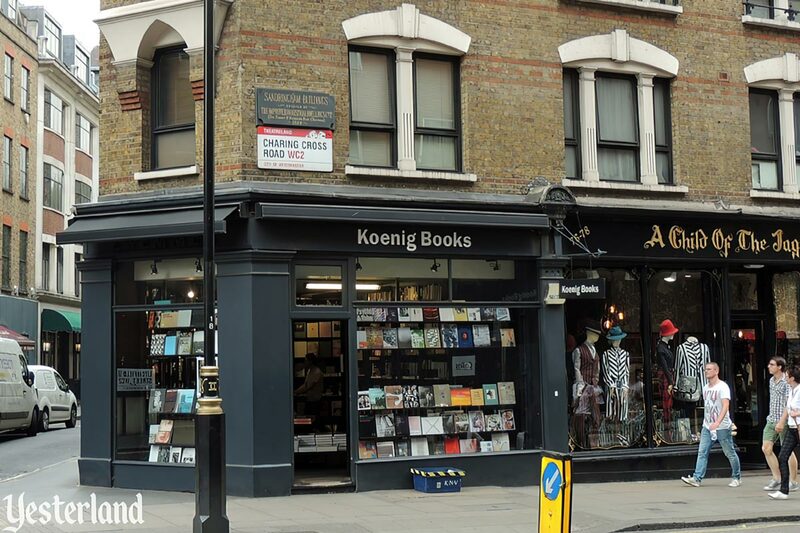 In London, Koenig Books, in the space that inspired the look of the book store at Universal, is an outpost of a German book seller. Below the blue sign on the Leicester Square Station façade at Universal, the gate is always closed. But to its right, park guests leave the Muggle world to be immersed in the district where wizards do their shopping, banking, and socializing. 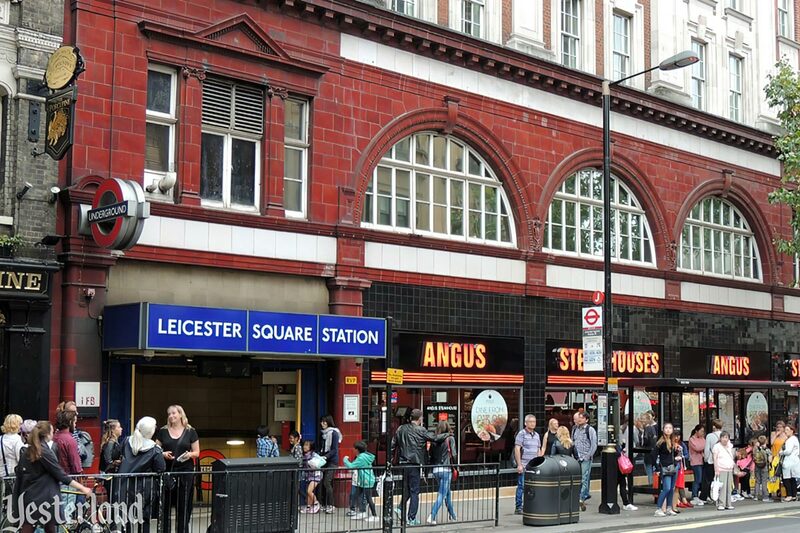 The real Leicester Square Station is at the heart of London’s West End Theatre District. The station has four entrances serving the London Underground transit platforms far below. Two of them are in a corner building with glazed red terracotta on its first two levels. 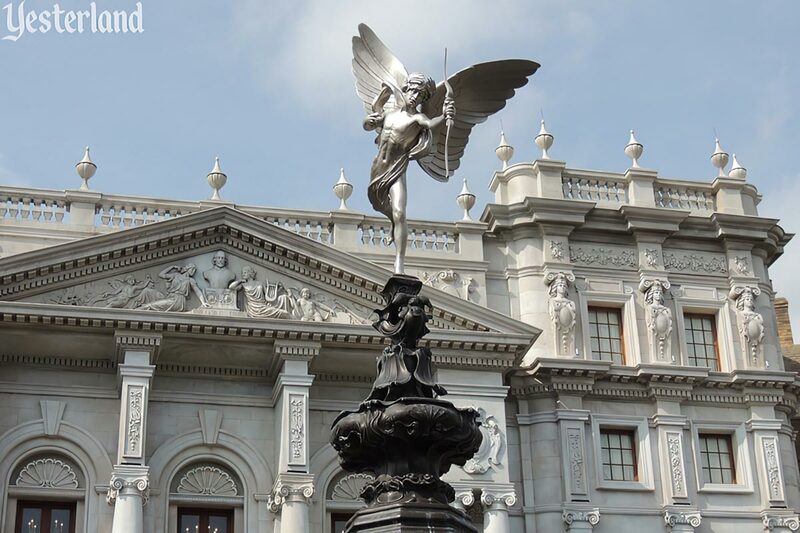 At Universal, there’s a replica of possibly the best known sculpture is London. 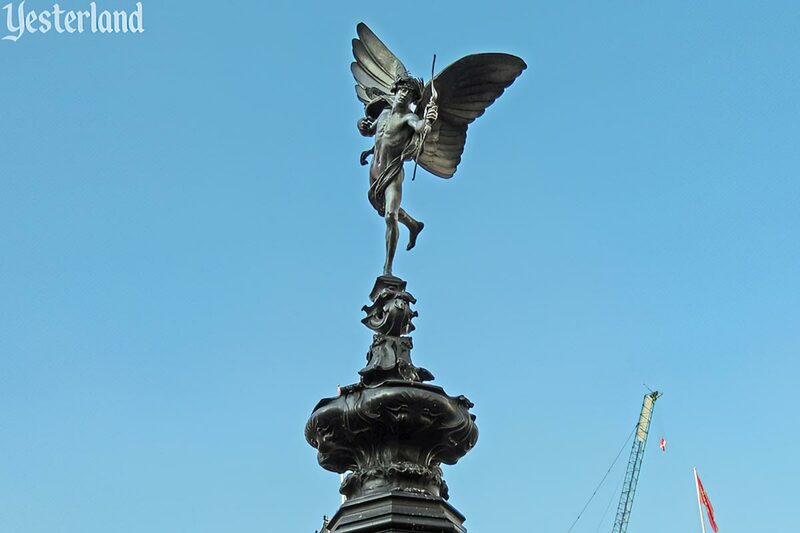 The original at Piccadilly Circus is usually called Eros. Circus refers to the open space at a street junction, not to a travelling company of acrobats and other performers. The subject is actually Anteros, the brother of Eros. Both brothers are winged Greek gods of love. 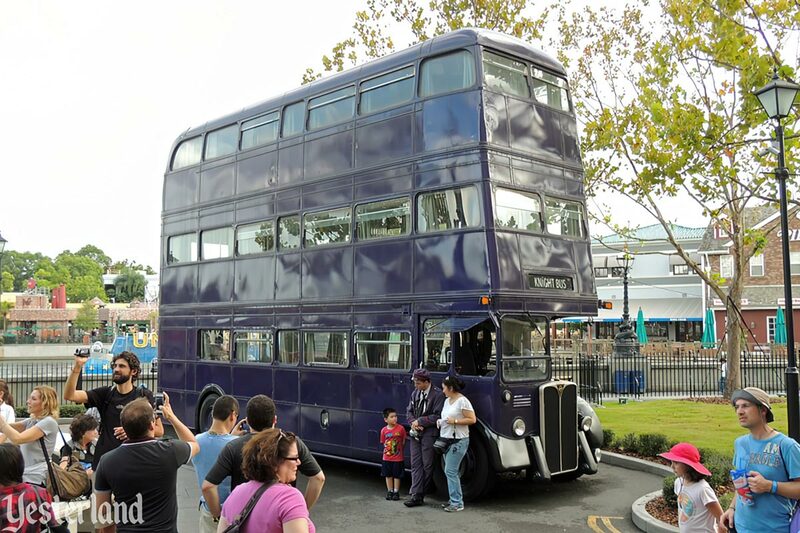 The purple, triple-decker Knight Bus at Universal is not a ride, but a meet-and-greet background. It’s a modified version of a classic AEC Regent III double-decker bus, the predominant London bus of the 1950s. 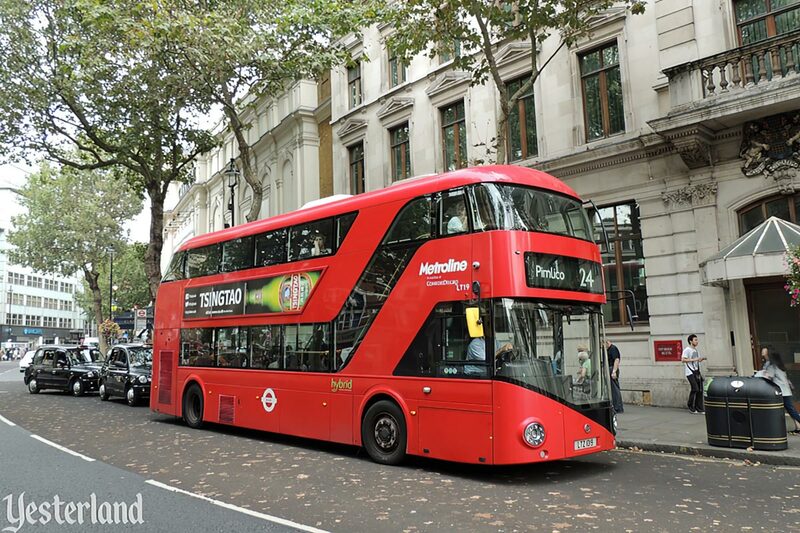 Double-decker buses are still a common sight in London, but they now tend to be efficient, modern buses, such as the red Routemaster hybrid-engine bus above. The name Knight Bus is a play on the night bus designation for routes that operate overnight. Abutting the Leicester Square Station façade, Universal has the façade of one of London’s most ornate West End theaters, Wyndham’s Theatre. 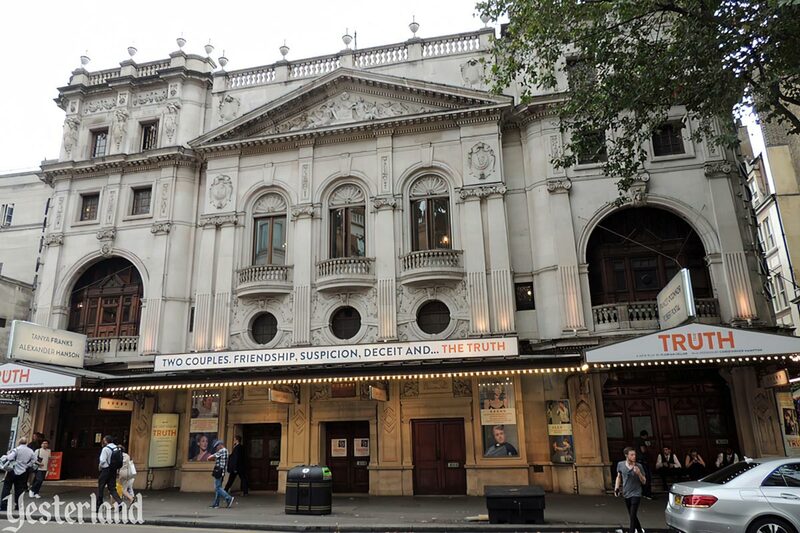 The real Wyndham’s Theatre opened in 1899. It’s on Charing Cross Road, with a real Leicester Square Station entrance to its left—although a different entrance than the one at Universal. The red terra cotta entrance is just a block away. 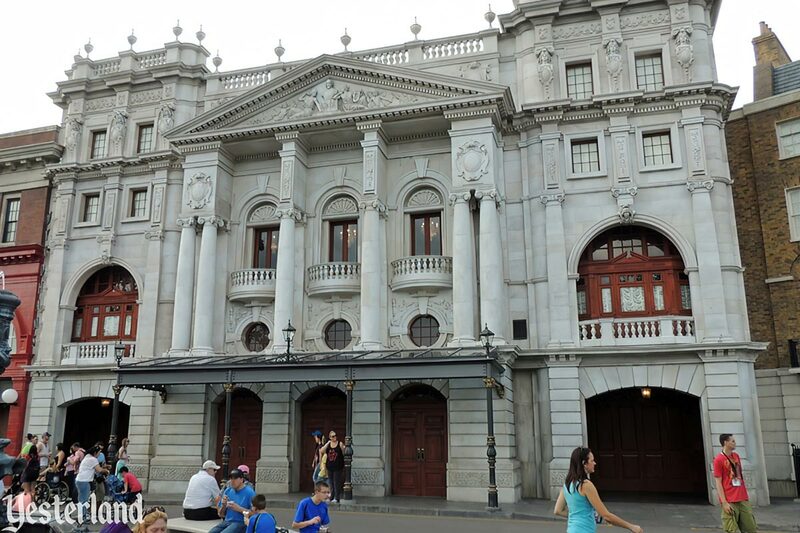 To the right of Wyndham’s Theatre, a 19th-century row house façade completes the exterior of Diagon Alley. It represents Grimmauld Place, where number 12 was the ancestral home of Sirius Black’s family. 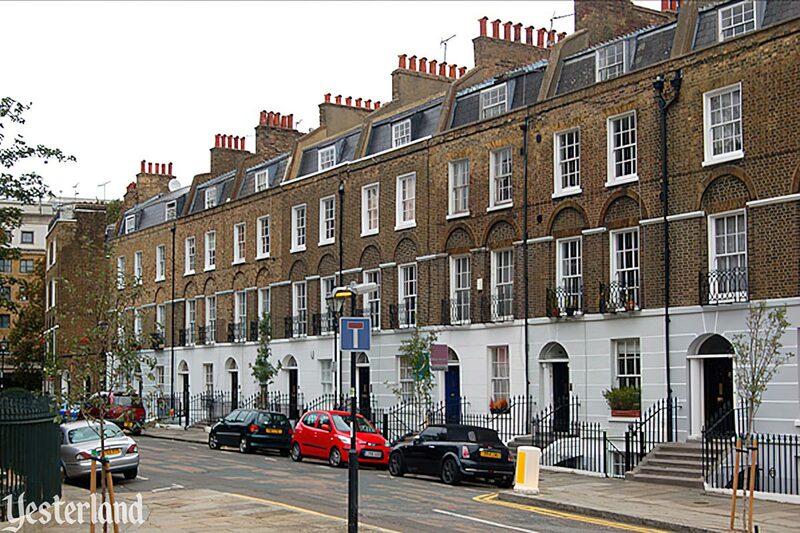 For the Warner Bros. movie franchise, London’s Claremont Square served as Grimmauld Place. The historic residences are around 2/3 of a mile east of King’s Cross Station and almost two miles from Wyndham’s Theatre. 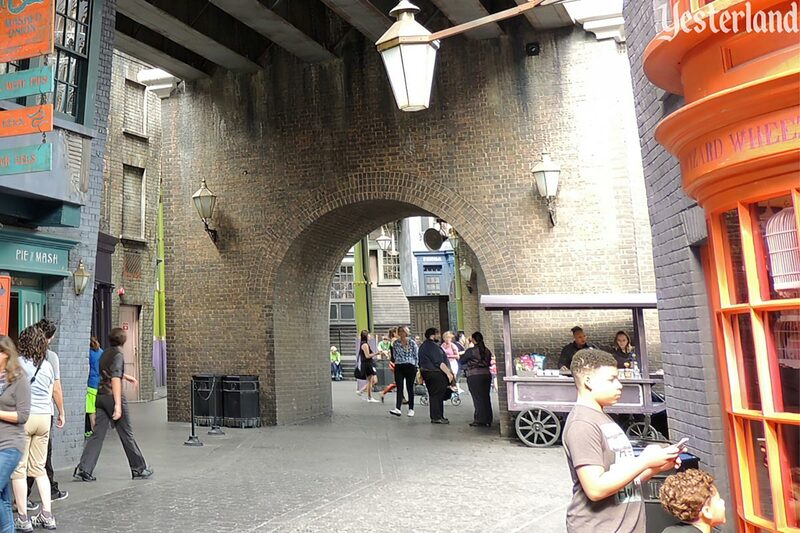 Behind the landmarks on the embankment, Diagon Alley immerses guests completely. 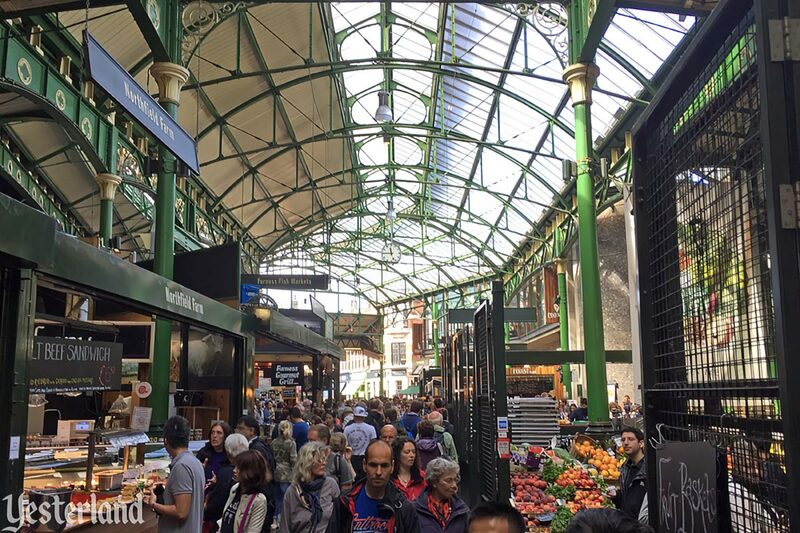 Although Universal’s Diagon Alley is fictional and London’s Borough Market is real, the similarities are uncanny. Both have overhead bridge structures, brown brick walls with arches, and delicate iron structures supporting a partial glass roof. The old-fashioned glass roof of Diagon Alley has the look of London marketplaces, while protecting guests from Florida rain storms. 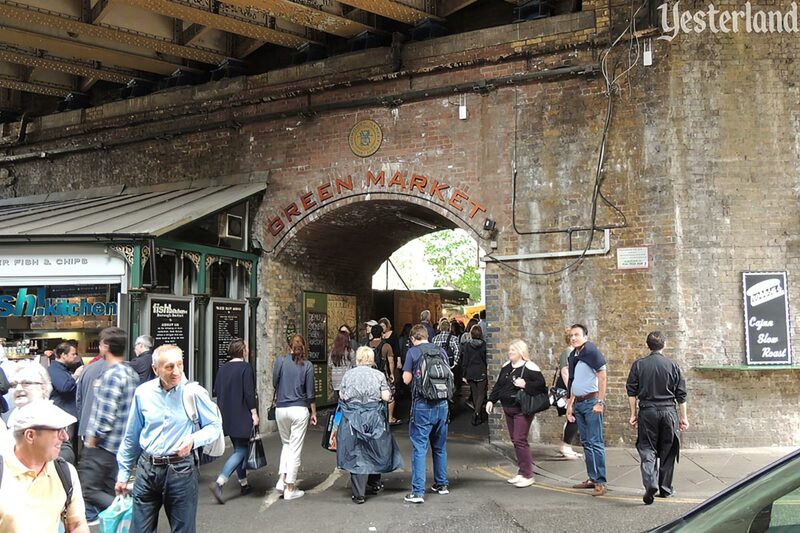 Borough Market, on the south bank of Thames River at the London Bridge, traces its history back around 1,000 years. These days, it’s a busy, vibrant place where vendors sell everything from traditional local produce to the trendiest street food.